Top three for Peugeot and top two for Tatra. The 10,000km Trans-Eurasian odyssey started in Moscow today. The route for the 2017 edition of the Silk Way Rally has been officially unveiled in Moscow, Russia. Yamaha’s Xavier de Soultrait claimed the final stage of Merzouga Rally to seal his overall victory on the Cross-Country event in Morocco. Oriol Mena scored his first victory on the penultimate stage on his first attempt at the Merzouga Rally in Morocco. 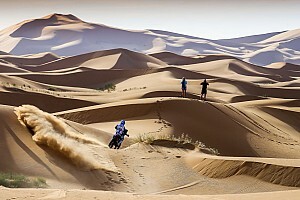 Argentine rider Franco Caimi beat Gerard Farres and Xavier de Soultrait on first Marathon stage in the Erg Rissani dune complex of the cross-country Merzouga Rally event. Sherco TVS’ Aravind KP was the star Indian performer in the fourth stage of Merzouga Rally, but compatriot and Hero rival CS Santosh remains the top rider from the subcontinent. HIMOINSA's Spanish rider Gerard Farres won the 175km third stage of Merzouga Rally, but still trails Yamaha's Xavier de Soultrait overall. Yamaha Team France rider Xavier de Soultrait scored his second stage win of Merzouga Rally on Monday, following on from his victory in Sunday’s opener. Sherco TVS' Juan Pedrero broke inside the top five in the second stage of Merzouga Rally on Monday, while Hero’s CS Santosh finished as the leading Indian rider in 15th. Hero and Sherco TVS teams started the Merzouga Rally on a strong note, with both the Indian manufacturers having one rider inside the top 10 at the end of stage 1. Toyota Gazoo driver Nasser Al-Attiyah will be returning to the Silk Way Rally in 2017, the Qatari set to go up against reigning champions Peugeot. Sebastien Loeb, Stephane Peterhansel and reigning champion Cyril Despres will all be returning to the Silk Way Rally for the 2017 edition of the race, Peugeot has announced. The final day in Morocco Rally saw TVS Sherco's Aravind KP rounding off a top 30 finish, with Hero's CS Santosh completing the rally after Wednesday's troubles. Nasser Al-Attiyah completed a Rally Morocco hat-trick after winning the event for the third time in a row, beating nearest rival Carlos Sainz by more than 10 minutes in the newly-introduced Toyota Hilux Overdrive. TVS Sherco's Aravind KP ended the fourth stage in the Morocco Rally inside top 30, while Hero’s CS Santosh resumed his outing following Wednesday's retirement. Hero's CS Santosh retired from the day's proceedings in Oilibiya Rally in Morocco after facing trouble on his bike, as TVS Sherco's Joan Pedrero continued to lead among the two Indian teams.